The only reason to go to Miami 30 years ago was to visit Grandma. Now, this southern city is America’s premier culture destination by the beach, a stop on any art intelligentsia’s itinerary, and a must-visit for mere mortals with a love of la vida loca. 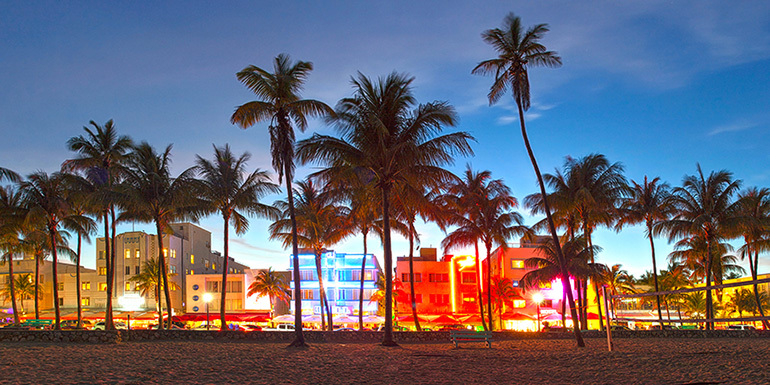 Whether you’re browsing the Design District or grabbing a mojito in the shadow of an art deco masterpiece, Miami has revelry at every volume — which means that, even if you just want to stroll the shore and admire the beautiful people who call Miami their second (or third) home, you’ve come to the right place. 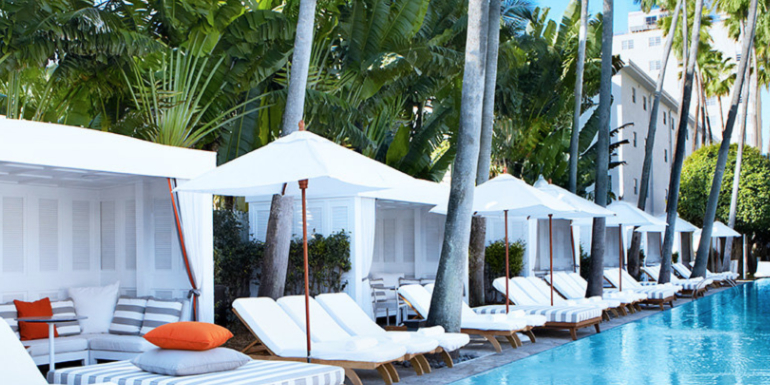 Splurge: Delano Hotel – Hotelier Ian Schrager put Miami on the map back in 1995, when he opened the white-on-white Delano Hotel on Collins Avenue. Architect Philippe Starck’s shrine to modernism sparked a revolution with its austere rooms, infinity-edge pool, and a to-die-for art collection, including works by Salvador Dalí and Man Ray. This is where that signature Miami vibrancy began, and continues — you never know who you’ll see behind the billowing curtains in the lobby. Steal: YVE Hotel Miami — Located in downtown Miami but just minutes away from some of the city's best beaches, the YVE Hotel Miami touts itself as being the "best of both worlds." Tip: The beauty of South Beach is that you don’t have to be a hotel guest to access a pool along buzzy Collins Avenue. When the sun sets, even the most-booked hotels open their pools up to the public for cocktails and lounging to the beats of in-house DJs. On most days for just $30, you can buy a pass and dive into the stunning pool at The Raleigh — where Esther Williams filmed her famous mermaid movie. Breakfast: News Café – It’s a classic, and with good reason. 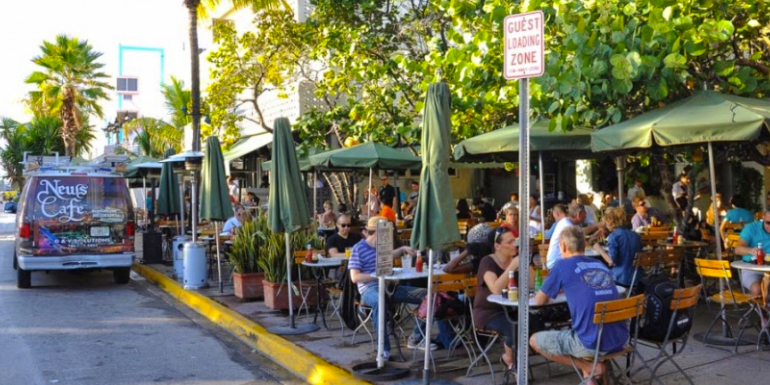 The News Café is a mainstay of Miami, serving eggs Benedict and bloody marys 24/7. (It was Gianni Versace’s favorite breakfast spot back in the day.) Come early and, if you’re lucky, you can still catch last night’s partiers dolled up in their barely-there disco garb, scarfing down huevos rancheros as the sun comes up. Lunch: Joe’s Stone Crab – Ask anyone in Miami where to have the ultimate local meal, and chances are good that all paths will lead you to Joe's Stone Crab. Try to snag a table in the original dining room, and pace yourself. It’s easy to overdo it on the enormous namesake claws, but there are other to-die-for options, including the summer tomato salad and the asparagus with blue cheese sauce. Dinner: Larios on the Beach – Singer Gloria Estefan’s Cuban restaurant is kind of a mob scene, especially on weekends, and the food isn’t spectacular. But Larios offers an incredible glimpse into Miami living. Come for a Texas-sized portion of well-turned-out rice and beans, and check out the people cruising the sidewalk. Or sit inside as day turns to night and watch the restaurant transform into a salsa club. Dessert: Michael’s Genuine Food & Drink – Pretty much anything on the menu at Michael’s Genuine will impress, but if your particular vice is dessert, you’re in for a treat. These childhood-inspired indulgences — including a passion fruit pot de crème served with coconut donuts, and the insanely good Home Brew Sundae (which proves the equation that beer-flavored ice cream + malted caramel + pretzels + marshmallows = yum) — are made with locally sourced ingredients. Tip: Leave time to browse the 40,000 square feet of Herzog & de Meuron’s inspired “upcycling” of an old parking garage, 1111 Lincoln Road, a creatively integrated shopping, dining, and parking space. Don’t miss the only-in-Miami retail, including Osklen and Y-3 boutiques. 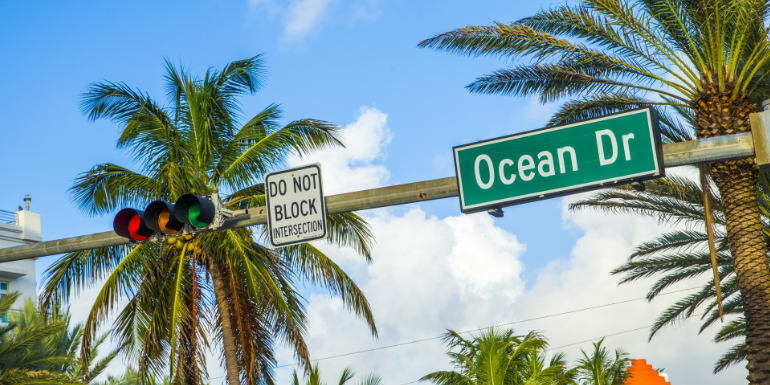 For everyone: Ocean Drive – Known for its art deco hotels, Ocean Drive counts about 800 preserved buildings on its tree-lined boulevard. Walk through decades as you watch Streamline Moderne evolve into the art deco style that defines Miami, and don’t miss the famed Versace mansion. For couples: Vizcaya Museum and Gardens – Vizcaya is one of the nation’s most glorious garden settings. Reserve time to explore: The property, which dates back to 1916, features a main house, 10 acres of formal gardens, and a native forest. For families: Zoo Miami – Considered one of the best zoos in the world, Zoo Miami counts more than 2,000 animals in its collection, which is divided into geographic regions. Rent a Safari Cycle (a cross between a golf cart and a bike), and you can move fast enough to see every animal — from Australian koalas to African elephants — in one visit. Leave time for the Giraffe Feeding Station, where the dainty mammals eat right out of your hands. For the adventurous: At Miami Seaquarium you can don wetsuits and learn about dolphins through an interactive course with a trainer. Then wade into the salty lagoons to join the ocean’s most intelligent animals. Tip: If shopping is your bag, head north, where high-end boutiques make up Bal Harbour Shops, a sprawling outdoor mall that claims the highest sales per square foot in the country. Though expensive, some retailers claim that prices of luxury goods are cheaper here than anywhere else in the world. If you’re staying more than one night, you’ll need a car to get from downtown to Bal Harbour to the zoo. But if you want to concentrate your efforts, stick to South Beach (called SoBe) and take public transport or hail taxis on the street. What are your favorite places to go in Miami? GET THE HELL OUT OF MIAMI! Seriously, take it from me, a native, and head straight west on SW 8 St. ("Calle Ocho") which is also US 41-Tamiami Trail. Go to the end of civilization and as the Everglades begins, on the left is Coopertown. Park the car opposite the famous Coopertown Bridge. Go immediately into the restaurant/City Hall/Mayor's Office and buy tickets for the best and closest airboat ride. Take tons of photos of alligators, purple gallinules and blue herons. While you're there indulge in the most delicious fried frog legs and gator tail you've ever eaten. Check out the wildlife in the back. Be sure to pet the baby rattler. Coopertown is far enough to tell you you're in some otherworldly place, near enough to be a half-day trip. You'll be talking about this place to your friends up North for years.